The Colne Valley forms a natural barrier along the western edge of London. The river and the Grand Union canal thread along the border, with a necklace of lakes (formerly gravel pits) to either side. Section 12 is almost exclusively a waterside stroll, no doubt green and pleasant in the summer, but a little bleaker midwinter. Uxbridge was in Christmas mode. A fir tree in the High Street, Santa selling helium balloons outside the shopping mall, the Salvation Army band playing The First Nowell. I don't think I've ever been somewhere where the people walk quite so slowly, so it's no hardship to escape down the hill to the canal. This quarter of Uxbridge resembles Slough, and not in a good way, apart from a couple of characterful pubs dotted in amongst the lowrise offices. The Loop proper begins at the Swan and Bottle, as does the Colne Valley Trail which follows the canal all the way to Rickmansworth. A short distance ahead is the first of four locks, Uxbridge Lock, this one double width and being put to good use by two narrowboats as I passed [photo]. The flats on the western bank are a recent erection on the site of a large flour mill. This was originally owned by William King, who named the building Kingsmill, and yes, that's precisely where the loaf-of-bread brand name originated. 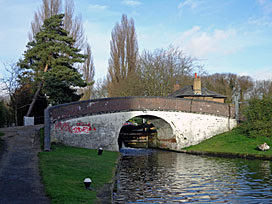 Visit an urban canal in December and the banks are often lined with overwintering narrowboats. There are plenty along this stretch, a short bike ride from the shops, with the towpath littered with chopped branches and the occasional axe. While one boat owner crawled inside his floating woodshed, his dog trooped out onto the path and engaged me in a stand-off. I thought I was going to have to abandon my walk there and then, but the hound eventually lost interest and slunk back aboard the boat allowing me to (deep breath) slip past. The viaduct ahead carries the A40, just before it becomes the M40, across the Colne Valley. And then we're out into proper open countryside, mostly flat and marshy. This is Buckinghamshire, just, then a few hundred yards ahead it's London again, only marginally. 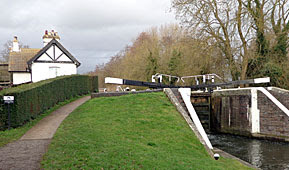 With a descent of eleven feet, Denham Lock is the deepest on the entire Grand Union Canal [photo]. It needs to be deep because the Frays River passes almost directly underneath, such are the convolutions of natural and manmade waterways hereabouts. At sunnier times the grass behind the lockkeeper's cottage is opened as Fran's Tea Garden, but that's more an undercover offering at this time of year, and there was no sign of any business on my passing. The next footbridge is steep, both up and down, leading across to the first of a sequence of very large lakes. This is Denham Quarry, an area of former gravel pits, now an overwintering hotspot for grebes, shovelers and tufted ducks. The Loop continues along a potholed track between canal and lake, with the occasional angler in a landrover sploshing his way to and fro. Elsewhere they lurk by the waterside in bivouacs, maggots wriggling, awaiting a freshwater bite. The next viaduct carries the Chiltern railway line, which is Victorian brick and therefore acceptable, but a future adjacent development doesn't have the local community onside. 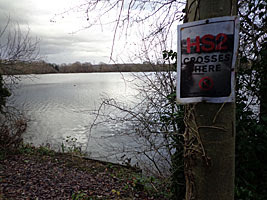 HS2 escapes the capital precisely here, its viaduct on a longer diagonal trajectory across the middle of a lake. A spur line to Heathrow might also branch off here, the majority in tunnel, but a gaping scar left where it buries underground. For the first time on this walk the Loop deviates from the water's edge, but only because a marina's in the way. Again it's full of narrowboats going nowhere, a few with steaming chimneys, the majority empty. A brief patch of woodland leads to South Harefield, one of London's least well-known settlements, although all you'll see is a commercial estate, a hump bridge and a pub - the appropriately named Horse and Barge. Black Jack's Lock saw the return of civilisation, and a former watermill that's now a particularly out-of-the-way bed and breakfast [photo]. One particular moored narrowboat displayed a sign reading "For Ducks Sake Slow Down", which might have been a message to waterborne traffic, or might have been for the benefit of waterfowl using the canal as a runway. It was raining steadily as I reached Coppermill Bridge, now fractionally into Hertfordshire, and the end of this section of the Loop. A welcoming light, and the hearty smell of pie, came from the Coy Carp pub, but I wasn't hanging around. I set off up the hill to Harefield to catch the bus, turning back (with mild awe) to see the darkening Colne Valley spread out before me. I hadn't realised quite how deep and green it was while walking it. Hopefully section 13, when I eventually return, will make that a lot clearer.